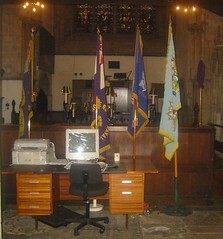 This “Lord Mayor’s chapel” was originally built to service a hospital in the 13th century. It was bought by the City of Bristol and is the only chapel owned by a “city” (corporation). Rather than owned, for example, by a religious order or private family. It clearly demonstrates the close relationship between local city administration and religion in Britain. Whether this close relationship is a good thing is open to debate. Id be curious about people’s opinions. When I looked around the church I found the mix of old and new artefacts intriguing. Illustrated by the desk and computer photographed below. This scribble was published on Tuesday, March 22nd, 2005. You can follow any banter on this scribble with the RSS 2.0 feed. You can share your inspired musings after typing the anti spam word near the bottom of the page. But no Pinging because its too naughty.